Summary: The Indiana University Innovation Center is a 40,000 square foot, two-story incubator office building that is adjacent to Indiana University Bloomington campus. The Innovation Center is intended to provide working space for science-based (both life science and Internet technology) business ventures. The Innovation Center is one of IU's first major initiatives under President Michael McRobbie's Innovate Indiana program, which focuses on expanding economic development across the state. 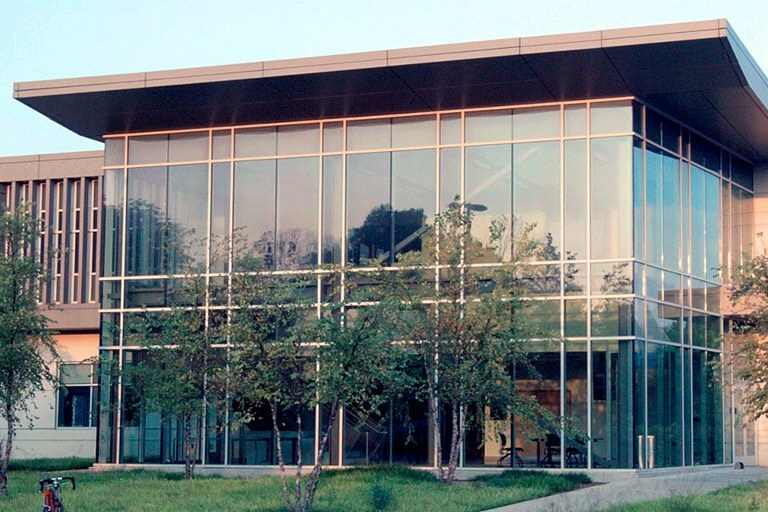 The building is managed and operated by the IU Research and Technology Corporation. The building, oriented along an east/west axis and designed with large areas of glazing on all sides, maximizes day-lighting and view potentials. The building has reduced potable water use by over 40% through the installation of dual flush toilets, low flow sinks, low flow showers, low flow urinals, and ultra low flow lavatories. 35% of the total building materials content, by value, was manufactured using recycled materials. Additionally, almost 40% of the the total building materials were comprised of materials and/or products that were extracted, harvester or recovered, as well as manufactured within 500 miles of the project site. The lighting control strategy for this building combined the benefits of automated lighting controls for energy efficiency while also utilizing strategically located manual controls to allow additional flexibility to adjust lighting levels for individual needs. The domestic water heater was specified to be a 94% efficient, condensing-style water heater to aid in the building’s energy model rating.